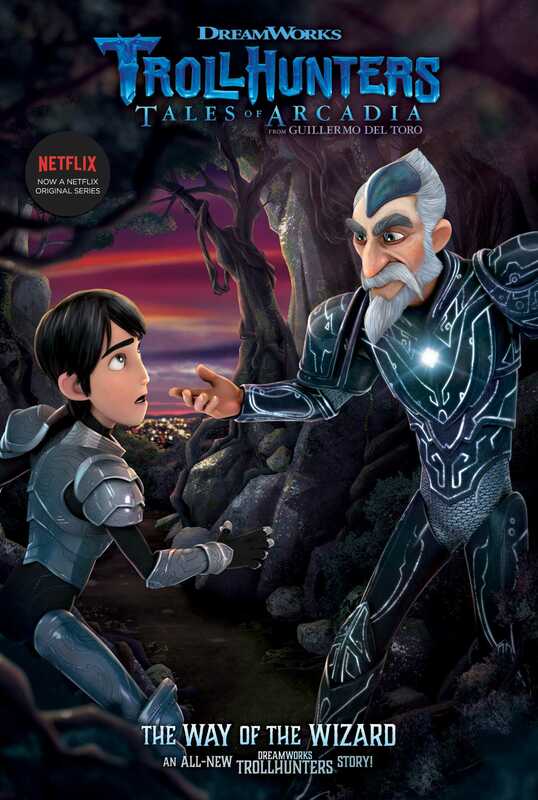 Jim prepares to fight a Troll civil war in this all-new epic story based on the hit Netflix series Trollhunters—from the limitless imagination of acclaimed filmmaker Guillermo del Toro and DreamWorks Animation. Jim and the Trollhunters team have finally found the wizard Merlin, but at a terrible cost. One of their beloved Troll friends has fallen in battle. Jim must now come to terms with true, lasting death for the first time in his young life. But there is little time to mourn—Jim must reclaim his fighting spirit because a civil war is about to commence among the various underground Troll communities. If not controlled, it will spill into the human world. Once again the fate of the entire planet rests on Jim’s shoulders. Will he be able to shoulder these epic responsibilities? Twelve hundred years after his birth, Draal the Deadly was dead. Jim Lake Jr. dropped to his knees. He stared wordlessly at the lifeless stone body of the Troll, the bodyguard, the friend who’d fallen to his death so that Jim might live. It had taken the young human Trollhunter a while to descend into the geode pit, to scale the massive white crystals studding its walls. The fact that Jim’s clothes and shoes were waterlogged—the result of his recent escape from a submerged catacomb—hadn’t helped during the arduous, slippery climb. But now that he’d reached the bottom and seen Draal’s remains illuminated in the crystals’ harsh glare, Jim didn’t know what to do next. When Jim and Draal had first met, it was as enemies. Draal believed the Amulet should have chosen him, not some fleshbag, after leaving its previous champion—Draal’s own father, Kanjigar. And so Draal challenged Jim to trial by combat, only for the newly minted Trollhunter to best his blue, spiked opponent. Even more surprising, though, was the way Jim broke with Troll custom afterward and spared Draal’s life. As a means of repayment, the humbled son of Kanjigar made an oath to guard the Trollhunter, his mother, and their home. And Draal had indeed kept his promise, protecting Jim’s loved ones and training the Trollhunter in swordsmanship. The loyal Troll had even sacrificed his own right arm to thwart one of Gunmar’s earlier attempts to escape the Darklands. Now, Jim understood, Draal had sacrificed the rest of his body in service of his beloved Trollhunter—just as the Gumm-Gumm king had eventually succeeded in returning to the surface world. But to lose Draal, with Gunmar still alive and free, seemed so pointless to Jim . . . so unfair . . . so unreal . . . The Trollhunter stood, quickly wiping his eyes with the back of his sleeve. He saw his six-eyed Troll mentor, Blinky, reach the base of the pit, followed by the rest of his soaking-wet friends—Claire Nuñez, Toby Domzalski, and AAARRRGGHH!!! Jim’s mind flooded with hatred for the assassin who’d killed Draal. Team Trollhunters had long believed Angor Rot dead, only to discover he was back and working for Gunmar. And Jim had been so focused on stopping Gunmar earlier, he hadn’t noticed Angor Rot stalking behind him, his dagger laced with lethal Creeper’s Sun poison. But Draal noticed. Draal put his body between Jim and the dagger. Draal turned to stone and fell to his doom. Not Angor Rot. Not Gunmar. Not Jim. “Not possible,” Jim muttered through clenched teeth. “All the above,” finished Toby. “It’s nougat, actually,” Toby corrected cheerfully. Jim and the others watched as the wizard stood over Draal and held out his hands with great authority, as if about to cast a powerful spell. Merlin cleared his throat and closed his eyes. “Here lies a warrior true, his words were few, and mostly said as a battle cry,” he began. Jim sighed heavily, remembering Draal’s legendary temper and aversion to small talk. “It’s such a shame, er, with Gumm-Gumms to blame, that Draal’s gone to that big Hero’s Forge in the sky,” Merlin finished in a rush, clearly making up that last part on the fly. Startled by the eulogy’s abrupt conclusion, every single member of Team Trollhunters glared at the wizard. But none more so that Jim. “Not! Helping!” Blinky snapped at Merlin. Claire cut off. She saw Draal’s stilled form, but no Jim keeping vigil over it. Team Trollhunters then heard the squeak of Jim’s wet sneakers as he climbed out of the geode pit. “I’d better talk to him,” said Toby, hitching up his pants in preparation of the long ascent. “I, Merlin, am clueless? !” Merlin repeated with umbrage. “Aha! You admitted it! No take-backs!” said Toby, flashing a braces-filled smile.